German born painter Lucian Freud was granted British citizenship in 1939 having fled Nazi persecution with his family ahead of the war. 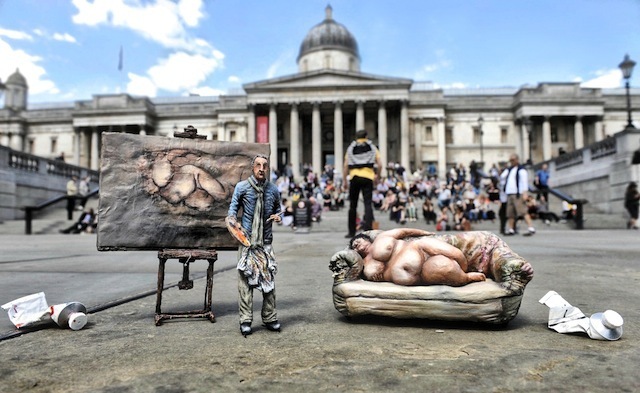 Here he is reunited outside the National Gallery in Trafalgar Square with his most famous muse 'Big Sue' who posed for his portrait 'Benefit Supervisor Sleeping'. Sir John Houblon, first governor of the Bank of England, and a French Huguenot who fled Catholic persecution in the 17th century. Architect Richard Rogers, whose family fled Trieste in northern Italy for the UK ahead of WWII, in front of the former Millennium Dome, one of his most famous creations. Queen front man Freddie Mercury fled Zanzibar with his parents in the 1960s during the island's revolution for independence. 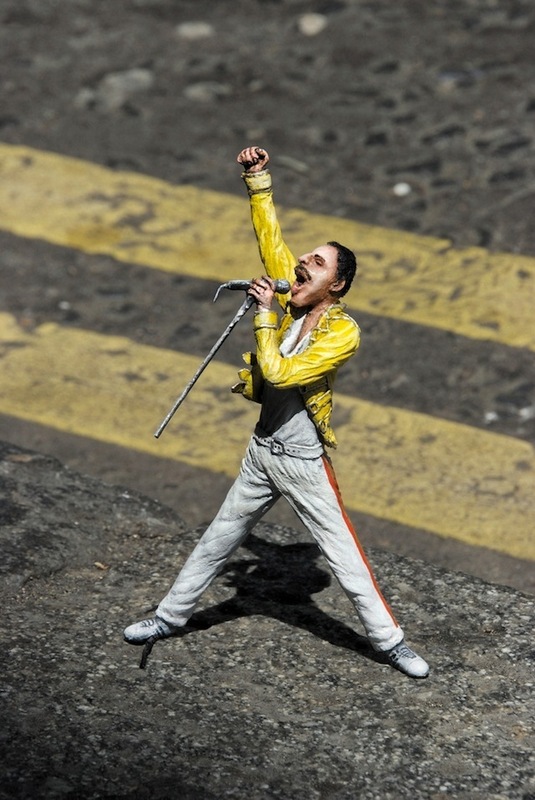 The sculpture is placed outside the Dominion Theatre where We Will Rock you has run for 11 years and where Mercury made his final public appearance to collect a Brit Award before his death in 1991. Syrian family with Red Cross worker: A mother and child, fleeing civil war in Syria, arrive at the British Red Cross' destitution centre in Hackney, London. The Red Cross helps 10,000 refugees and asylum seekers who arrive in the UK every year. 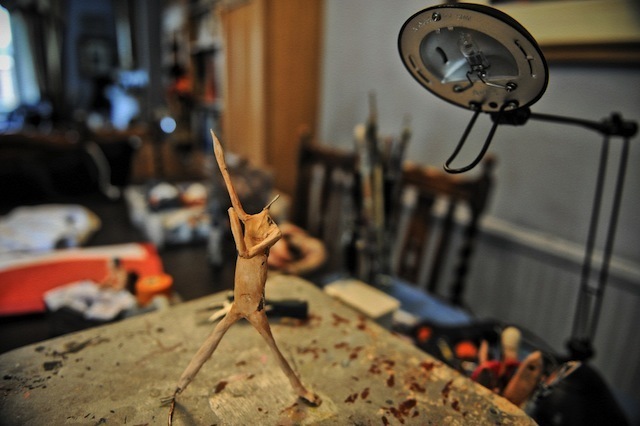 The Freddie Mercury sculpture under preparation in Marcus Crocker's studio. 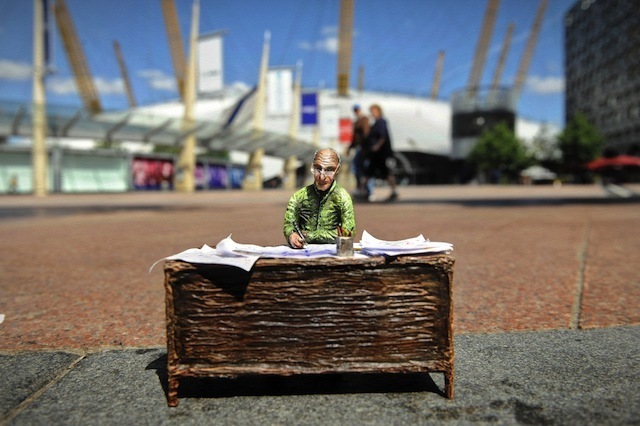 Take a close look at these diminutive sculptures. Four show famous figures associated with London — but all have something else in common. Freddie Mercury fled Zanzibar during the island's revolution. Lucian Freud became a British citizen after escaping Nazi Germany. 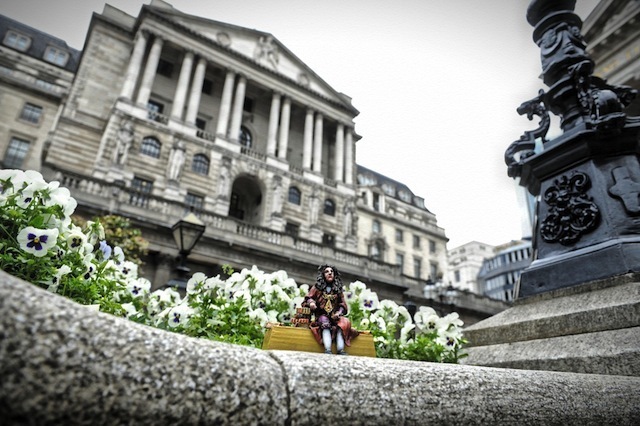 Sir John Houblon was the first Governor of the Bank of England, but only after fleeing Catholic persecution in France. And architect Richard Rogers altered the skyline of London after leaving Fascist Italy in the 1930s. In short, all are high-profile refugees. 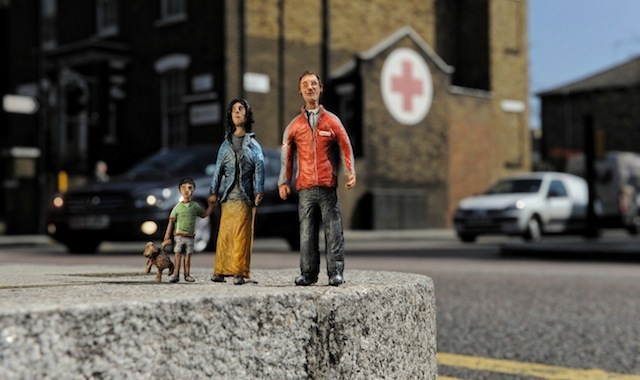 The four models, along with a depiction of a Syrian family with an aid worker, will be placed around London between 17 June and 23 June to mark Red Cross Refugee Week 2013. The models were created by the astonishingly talented Marcus Crocker, whose work we've previously featured. These latest pieces will be on show in front of buildings they are associated with. His models aim to raise awareness of the refugee roots of some very famous people, while celebrating their impact on British history and heritage. The public are invited to track them down and take a look. Follow the British Red Cross blog next week, or hashtag #RefugeeWeek for more.